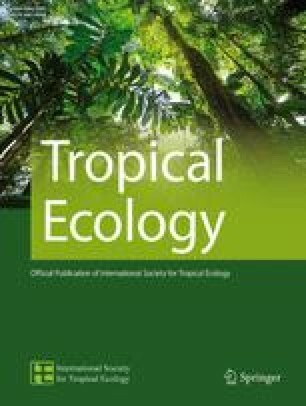 Avian frugivory and seed dispersal of an exotic palm Ptychosperma macarthurii (H. Wendl. ex H. J. Veitch) H. Wendl. ex Hook. f.
Frugivory and seed dispersal of Ptychosperma macarthurii were studied at Palmetum of KFRI Peechi campus. The whole day was divided into four time intervals morning (07.00–10.00), midday (10.00–01.00), afternoon (01.00–04.00), evening (04.00–07.00) for data collection. It was recorded that 13 bird species belonging to 11 families have been found to feed the ripened fruits of this exotic palm. The frugivores are Ocyceros griseus, Psilopogon viridis, Dendrocitta vagabunda, Eudynamys scolopaceus, Copsychus saularis, Spilopelia chinensis, Oriolus xanthomonas, Turdus simillimus, Myophonus horsfieldii, Pycnonotus cafer, Acridotheres javanicus, Acridotheres tristis and Pycnonotus jacosus. In the present study, birds preferred maximum feeding visit during morning and midday hours and minimum during evening and afternoon hours. Among 13 avian frugivores observed, Myna (2 species) and Rufous treepie made their fruit feeding visits in group and with other species and remaining species visited as single as well as with other species. It had been observed that, among avian frugivores, D. vagabunda consumed maximum number of fruits (average 6, n = 2) to be followed by A. javanicus (average 5, n = 2) O. griseus (average 9, n = 4) and appeared to be the major dispersers of P. macarthurii seeds. We thank the Dr. Syam Viswanath, Director, Kerala Forest Research Institute, Peechi for providing facilities and support for conducting this study. Kerala State Council for Science Technology Environment (KSCSTE), Thiruvananthapuram is also acknowledged for financial support and infrastructure for maintaining the ex-situ collections.